We operate one of the largest and most comfortable shop in the B2B sector. Our Cash & Carry warehouse is located in Waiblingen near Stuttgart. There you can view all items available in the shop itself and choose right. Can buy from us, without exception, all commercial businesses. We want to become your business partner and an advisor, so do not hesitate to get in touch regarding any questions that you have. Our sales managers, who can communicate in more than five languages, will always be ready to help. 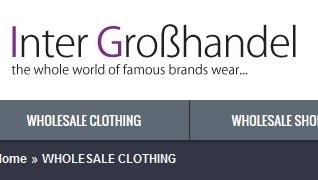 At the Inter Grosshandel GmbH you have the opportunity to buy exclusive brand products at discounted prices to buy. Our products are assembled in small, attractive packaging units and sorted by size. So you can be sure to get only what you really need. Because we buy our products in very large quantities directly from manufacturers and often without a middleman, we can pass this benefit on to you. So you can benefit from our purchasing volume. Because we, as your suppliers are naturally interested in your business success. Because if you sell our products profitably, you'll re-order these products. Wholesale priced clothes, shoes and accessories are accessible to anyone. It does not matter whether you are a small business representative, a physical person or an established player in the market, we will be happy to do business with you. It does not even matter where you are from because we trade in Germany, France, Italy, Great Britain, Russia, Belarus, Ukraine, Poland, Czech Republic, Austria and most the Europe. Unsere Ware verkaufen wir in gemischten Posten in denen Sie passend zur Saison Ware Fashion Großhandel kaufen können. Eine Auflistung hierzu können Sie direkt auf unserer Webseite aufrufen oder nach Anfrage von unseren Verkäufern per Email erhalten. Die Ware zu unserem Großhandelspreis kann von jedem gekauft werden. Ganz egal, ob Sie ein großes Unternehmen besitzen oder nur einen kleinen Online Shop betreiben. Es ist auch nicht wichtig, von welchem Land Sie die Ware kaufen – wir liefern Weltweit!